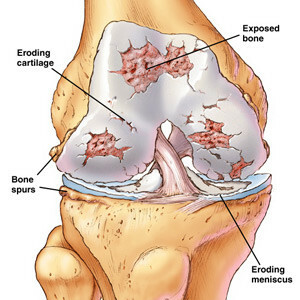 Osteoarthritis or wear and tear of the knee typically occurs in older people. It is characterised by general wear and tear of the knee: in addition to the thinning or loss of cartilage, the quality of the meniscus deteriorates. As a result, these structures lose their shock-absorbing function, which leads to strain of the underlying bone. This gives rise to typical, mechanical, load-related pain. Swelling, and a hot sensation and stiffness may also occur. This all leads to a loss of function such as the ability to walk as far, finding it difficult to get in and out of a chair, or having trouble climbing stairs. Initially the complaints come and go, there are good and bad days. However, in the long term the complaints will become more and more severe. 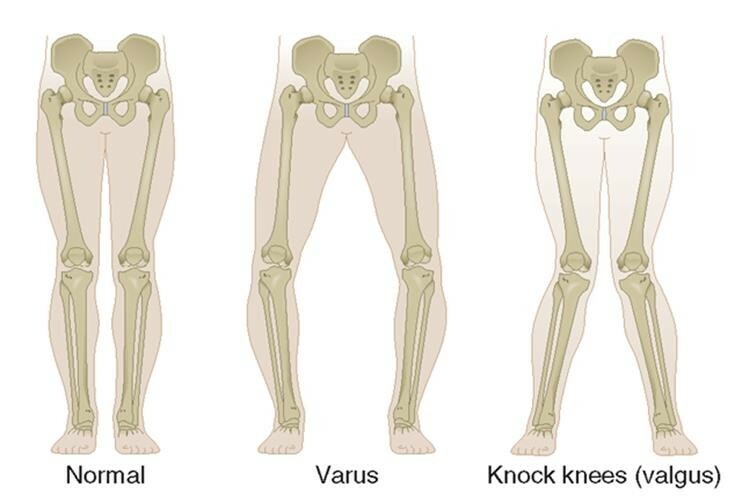 With more serious forms of osteoarthritis the knee may also become deformed, in which knock-knee or bow-leggedness may develop. 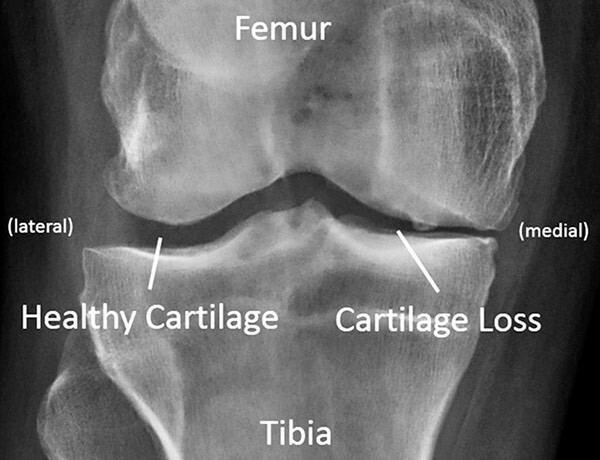 A serious examination of osteoarthritis involves X-rays. They are best taken with the patient standing up so that the narrowing of the joint can be observed properly. In many cases an NMR scan is unnecessary. There is still no cure for osteoarthritis. Treatment initially consists of controlling the symptoms with painkillers and anti-inflammatory medication. Muscle strengthening and adjusting the load is also recommended. A brace can help in this case. If the patient is overweight a weight reduction of 10% can provide significant improvement. Lastly, an injection in the knee can be administered, or a gel or powerful anti-inflammatory drug. If the conservative treatment fails, the next step is an operation. In the case of advanced wear and tear the only option is a knee replacement. In this scenario it is important that the patient’s complaints are severe enough and the knee demonstrates enough wear and tear, before deciding to proceed with the operation. In less pronounced forms of wear and tear other options, such as an arthroscopy or osteotomy should be considered. An osteotomy is an operation in which the leg’s alignment is corrected or adjusted. 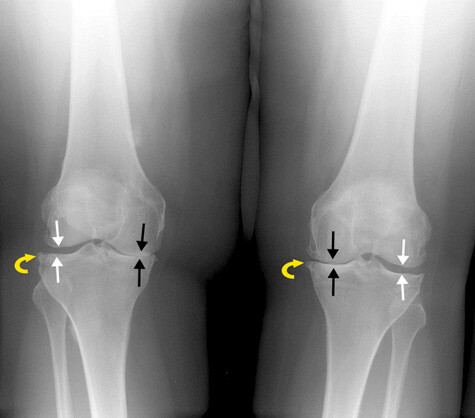 Young patients that develop osteoarthritis prematurely as a result of axial misalignment (knock-knee or bow-leggedness) are eligible for this procedure. This means the load on the cartilage can be reduced and the development of osteoarthritis delayed. It can avoid a knee replacement being performed at a relatively young age. The advantage of this procedure compared with the knee replacement is that your own knee can be fully preserved, which means it feels more natural and can often cope with a greater load, also in sports. During the operation the bone is almost sawn all the way through, tilted and fixed in place with a plate and screws. Depending on where the defect is, this is done above the knee (femur) or below (tibia). The patient generally stays in hospital for two to three days. After the procedure he or she will have to use crutches for around six weeks and will be unfit for work for between three and six months. The knee replacement is the ultimate treatment for osteoarthritis. A knee replacement is extremely effective treatment in the case of severe wear and tear of the knee and insufficient improvement of the complaints with pain medication. Long term results demonstrate that in 95% of cases current implants are effective for fifteen years and 85% for 20 years. This means the knee replacement will last most patients for the rest of their lives. There are different types of knee replacements: the total knee replacement, the unicondylar knee replacement (or half knee) and the patellofemoral knee replacement (or kneecap replacement). 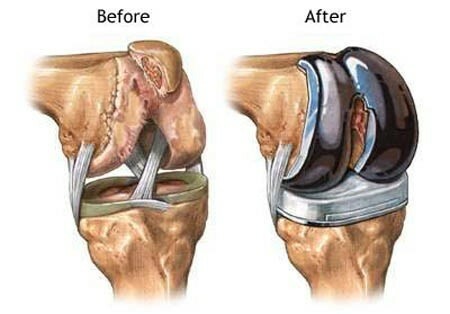 The total knee replacement is the most commonly performed knee replacement. It is used when the knee is totally worn out. During the procedure, the damaged cartilage is removed and replaced by a new metal cover, which is around nine millimetres thick. 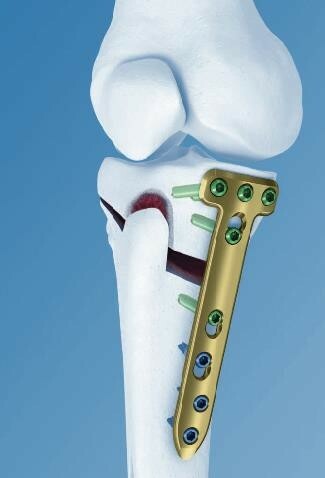 This knee prosthesis is affixed to the femur and tibia using a type of bone glue or cement. An artificial component is placed between the two metal components, consisting of extremely tough and wear-resistant polyethylene, over which the knee can smoothly bend and straighten. This all takes place using a muscle sparing technique which results in a quicker recovery. The half knee replacement or unicondylar knee replacement is performed if only part of the knee is worn out (inside or outside). Not everyone is eligible for this procedure. The major advantage of this type of knee replacement is that a large part of the patient’s own knee, including the cruciate ligaments, can be preserved. This also means quicker recovery for the patient and a knee that is more stable and feels more natural. In the long term the half knee replacement has now been proven to last at least as long as the total knee replacement. The patellofemoral prosthesis or kneecap prosthesis is a type of half knee replacement for people with wear and tear solely on the kneecap. The major advantages are the same as those of the half knee replacement: a large part of the patient’s own knee, including the cruciate ligaments, can be preserved. 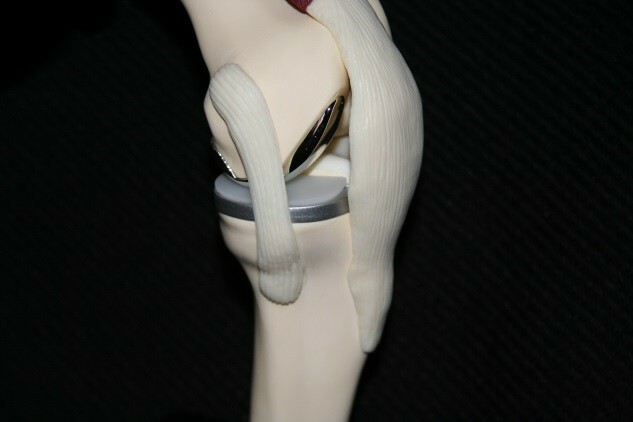 On inserting the knee prosthesis the activity-related pain disappears and the knee’s mobility improves. The knee must be able to bend with ease after recovery. It is also very important that the knee can be fully straightened. People with a knee prosthesis can and must be active: walking, cycling, swimming, and fitness are all no problem at all. However, contact sports are not recommended. After the operation the patient usually stays in hospital for four to five days and recovery takes around another six weeks with physiotherapy. By using the robot the position of the prosthesis can be adapted to the individual patient’s specific anatomy and biomechanics. In April 2018, AZ Delta in Roeselare purchased a high quality surgical robot (Mako) to use during knee replacements: total knee replacements, unicondylar knee replacement (medial or lateral), patellofemoral replacement as well as bicompartmental knee replacement (medial and patellofemoral) are performed using the Mako robot platform. The Mako robot performs a number of tasks during the operation. First, the surgeon gathers extra information about the individual patient’s specific anatomy and biomechanics. 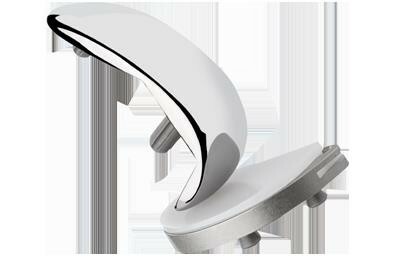 This means the optimal position of the knee prosthesis can be established in advance, for each patient individually. As soon as the optimal position of the knee prosthesis has been established the robot helps put the plan into practice via the robotic arm, by making highly precise bone cuts up to 0.5 mm and 0.5° accurate. With the robot the surgeon can meticulously determine the target and effectively achieve it. In other words, the Mako helps the surgeon determine the optimal position of the prosthesis tailored to each individual patient and after performing the calculation the Mako assists the surgeon in executing the plan by also inserting the prosthesis with the utmost precision. Another advantage of the robot is that a maximum of tissue is spared during the sawing process. The saw motor stops as soon as the saw blade exits the bone; this is called haptic feedback. It means surgical trauma is reduced further, which promotes a smooth and quick recovery. The risk of complications is minimised as a result. You could compare the Mako robot platform with the cockpit of an Airbus, which enables the pilot to consistently land on a landing strip just five metres wide. Due to its qualitative and multidisciplinary approach the Orthopaedic department in Roeselare is a pioneering service. The introduction of this smart robot in the operating theatre is the result of a very conscious decision by the hospital. The robot is used at the Brugsesteenweg Campus. This is our specialist, niche campus where our locomotor disciplines are based and our work is conducted in a highly interwoven manner. This robotic surgery will be provided by all the knee specialists at the Brugsesteenweg Campus of AZ Delta in Roeselare. Lastly, there are a number of new developments underway in which Orthopedie Roeselare is playing a leading role. In some cases we use instruments to insert the prosthesis tailored to the patient. A revision knee replacement is an operation in which a previously inserted knee prosthesis, which has worn out, is not working properly or has come loose, is replaced. Before the decision is taken to go ahead with a revision operation, it is always important to thoroughly investigate the cause of the problem. To do so the doctor will prick the knee to examine the fluid and conduct a number of additional imaging procedures. A revision procedure involves real customisation in which the specific problems are tackled. This may be different for each patient. The components inserted previously are either removed completely or partially and replaced by new ones, depending on the problem. 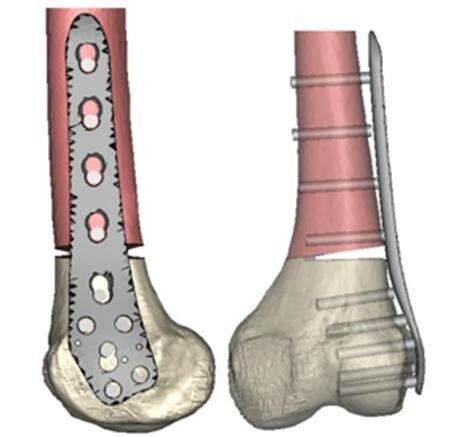 The revision prosthesis is usually fitted with stems for better anchoring in the bone. A revision operation is a more challenging operation than a first knee replacement and usually requires a longer recovery period.